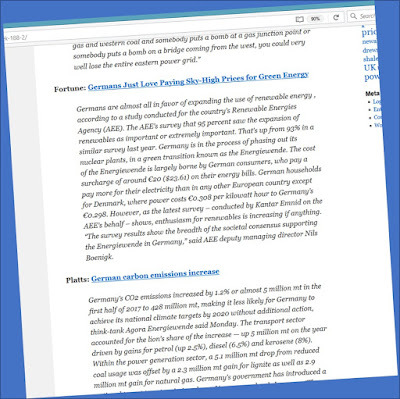 A primary go-to website for energy buffs is the excellent Energy Matters blog run by Euan Mearns and Roger Andrews, two first-rate analysts who somehow find time to keep their tremendous material pumping out for free. Go and have a poke around, if you haven't been there before. One of their regular features is a handy news round-up each week, from which we obtain this neat evidence of collective madness in Germany. Yes, (a) the Germans are big fans of their ridiculous 'energy policy' (which sees them paying extravagant electricity prices), and at the same time (b) German CO2 emissions continue to rise. Expensive and futile virtue-signalling by anyone's standards. I am sure Greek citizens are equally delighted that their economy is in thrall to German bankers. And Merkel's looking set for yet another victory! I've always been of the opinion that it's extremely difficult to analyse foreign elections because we can't pick up the nuances or cultures in which the campaigns are operating in but Merkel just seems like insanity. Mind you, if it's her or Schultz, i'd have given up ages ago. If you exclude taxes and levies German electricity prices were lower than UK in 2016H2 - they were pretty much the EU-28 average in fact. Are you saying that the taxes and levies are somehow filtered back into subsidies that EUstat don't eliminate for the pre-tax price they record? I'd be interested in a link explaining that mechanism. Surely high feed-in tariffs for solar flow straight-forwardly into the pre-tax price? The fact UK only charges 5% VAT on domestic energy for political reasons, whereas nearly all of the rest of the EU charges around 20%, is a large distortion if you only look at post tax prices. 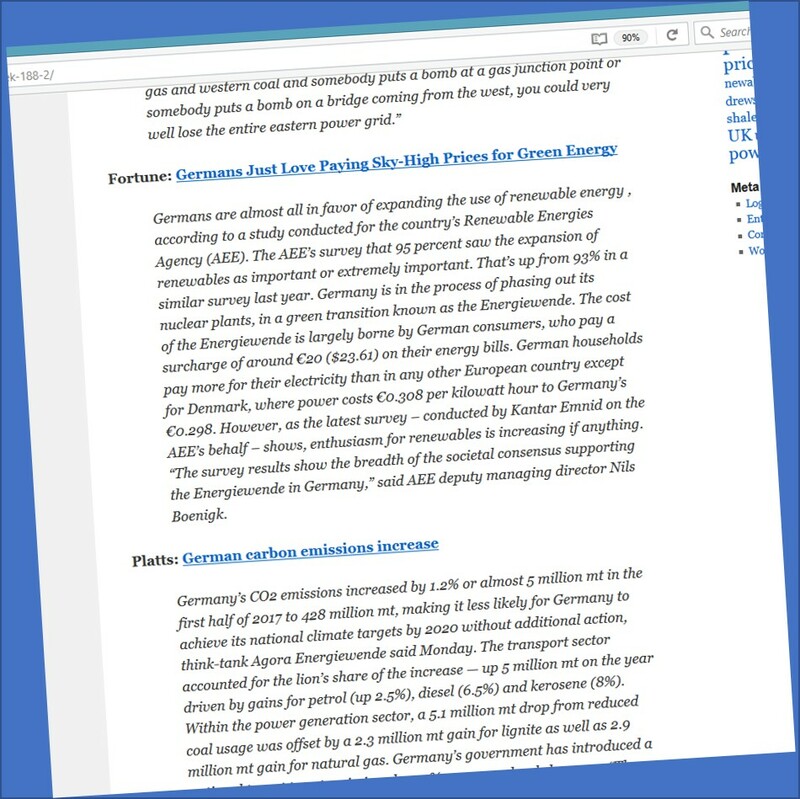 Energy Matters is one of my go to sites, it tries to explain just how and why the relevant issues are far more complex than we think. Does it matter? When Germany becomes a Sharia state it will have so little working industry that it won't need much generation capacity. Interesting. Isn't the renewables another way of not being dependent upon gazprom in the depths of January, as long as the wind blows? Then if siemans finally gets storage down to a reasonable price and scale then they could really pull up the drawbridge and just have the occasional lpg boat to keep things topped up. Nobody said it would be cheap though. Germans view the British desire to plunge lemming like over the cliff of Brexshite (and no i'm not a remainer) or our trust in politicians who have lied and have never had anything akin to a plan in much the same way we might view the German collective desire for Green (and more importantly non-nuclear) energy. As someone said above, it's a cultural nuance. Merkel may seem like insanity to us but to Germans she seems the safest of hands. Schulz on the other hand...the only thing he has going for him in the eyes of a lot of a Germans is that he is genuinely passionate about the EU. If Schulz wins we can expect none of the pragmatism of Merkel regarding Brexit, the man is a TrEU Believer. What makes you think Merkel is a pragmatist? The evidence from the Greek catastrophe is she is batshit insane. What a choice - Merkel or Schultz. TBD - The EU is going off a cliff edge. Why does no-one mention that ? In 15 to 20 years it will be North Africa. Growth in migration is exponential.